I have always wanted a Honda Ridgeline truck. I recently found one online at Mungenast Acura. When we got to the lot Jason was very responsive. Unfortunately the truck was not ready for sale immediately. But Jason kept in touch with me as the truck was going thru service and let me know as soon as the truck was ready for sale. I got a great truck for a great price. I finally got my Honda Ridgeline and couldn't be happier. Efficiency! 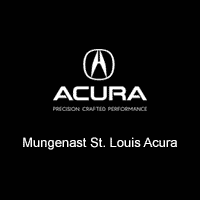 I initially discovered Mungenast St. Louis Acura online. Luckily one of their sales agent, Jason was more than helpful. With me being an out of state shopper, i was strapped for time, but Jason had me in and out in an hour. Smooth transaction knew what we wanted and we were in and out in about 1.5-2 hours. Would recommend this dealer to friends and family. Everything went extremely well & I had no issues with my experience. I would recommend this experience if you know exactly what you are looking for in a vehicle. Each visit has always been the fast, friendly and honest. In times past it was a known fact women were often taken advantage of when it came to car maintenance; however I've never felt that when leaving this location. I appreciate the team for explaining why something needs done and being patient with my questions. If you want the service you deserve, this is your place. I would gladly pay extra for a car, especially an Acura, knowing I have piece of mind and they will take care of me. I have had a few issues with our Acura and they have always found a solution and have taken care of us. Mark in the service dept has been extremely helpful. He has probably spent hours out of his day just on us. The staff ensures your are fully aware of what is going on, what they need and what to expect. Again, not a single complaint. They truly go above and beyond and do whatever possible to ensure you are taken care of. THANKS! There is a reason my wifes family has bought all their vehicles through them. I think its going on 5 now. I was in the market for new vehicle sooner than I had expected and on a time cruch, and was referred to this dealership by a friend. Greg R. was extremely helpful and rapidly expedited the process without ever coming off as pushy. The dealership even proactively set me up with an overnight trial in the model and trim I was interested in to ensure I had enough opportunity to drive it. Best experience I've had at a dealership yet.